Home » Featured » Just Tomatoes, Etc! Review and Giveaway! Just Tomatoes, Etc! Review and Giveaway! If you’ve ever longed for a healthy snack that your child actually WANTS to eat…If you’ve ever thrown your hands up in disgust at how much sugar is in “kid-friendly” snacks….If you are constantly scanning labels looking for products free from so many preservatives and artificial colors and flavorings…If you’re just a mom who likes good food…I have a company you need to meet!! When I stumbled upon the Just Tomatoes Etc! website several weeks ago, my heart skipped a beat, and I knew their products were exactly what I’d been looking for. True story…There is a lock on my pantry door. More than several times, I’ve walked downstairs to find my son (3) with chipmunk cheeks full of chocolate chips, marshmallows, multiple suckers….you name it! My little man has a sweet tooth, and takes every opportunity to reach for snacks that are sweet. My daughter is just a snacker…constantly asking for something to munch on…In both cases, I found myself worried about all of the sugar and just plain junk they were consuming. It seemed that every snack my kids were reaching for had loads of sugar and artificial ingredients…two things I’d really rather avoid when feeding my kids! However, I’m a realist…I know that kids want something sweet…something crunchy…something different than apple slices and carrot sticks. Then, I was sent a box featuring a handful of Just Tomatoes, Etc! products, and thought I just may have found something that would make all of us happy! I knew that I was right when I forgot to lock the pantry yesterday. I came downstairs to find not a myriad of candy wrappers all over the floor, but an empty package of “Just Strawberries and Bananas” from Just Tomatoes, Etc! It made me feel so happy to know that I didn’t need to worry about what my son had just eaten, because Just Tomatoes, Etc! uses ONLY fruit and veggies in ALL of their products…that’s it!! Just Tomatoes, Etc! 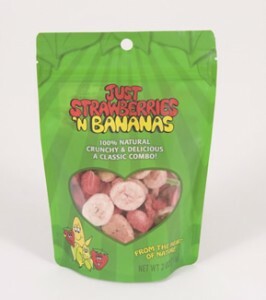 does not add ANYTHING to their incredible line of dehydrated and freeze-dried fruit and vegetable products…No added sugars, fats, preservatives, colorings…simply natural and delicious produce served up in a fun and unique way is what Just Tomatoes, Etc! is all about. All of the fruits and veggies used in their products are vine or tree ripened, picked at the height of freshness, washed, cut, and then carefully preserved using specially designed dehydrators, that are designed to preserve color, freshness, and taste. And trust me, you and your kids will LOVE the taste of these amazing (and fun!) dehydrated and freeze-dried produce from Just Tomatoes, Etc! Just imagine your kids happily munching on fruity snacks that are actually fruit!! We’ve tried other dried fruits in the past, but these are by far my favorites. I love the crunch and super fresh taste (and my kids do too!) My favorite so far has been the dehydrated pineapples! (So amazing!) I love knowing that my family is eating something completely natural and healthy….no more worrying about the kids sneaking unhealthy snacks…I have my snack bin stocked with products from Just Tomatoes, Etc! 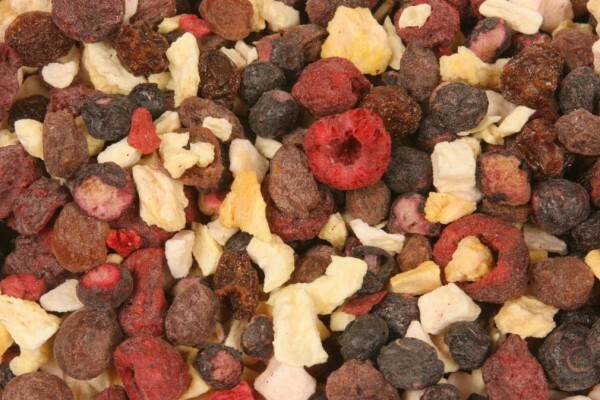 Just look at how amazing this snack mix looks….You can see that this is nothing but REAL fruit with NOTHING else added! It is JUST fruit and JUST delicious! We received a bag of Just Fruit Munchies, Just Strawberry Powder, and Just Veggies. While the Just Strawberries and Bananas, and Just Fruit Munchies make awesome snacks (perfect for the lunchbox, a snack on the go, or the perfect finger food for your toddler), the Just Strawberry Powder, and Just Veggies have been fun to cook with! (Just Tomatoes, Etc! actually has a wide variety of recipes posted on their site, and has lots of ideas for ways to use their products!) The Just Strawberry Powder would be incredible mixed into cream cheese and spread on a bagel, stirred into a creamy cheesecake, mixed into lemonade, or sprinkled on ice cream! The Just Veggies would be awesome mixed into rice or pasta (can’t wait to try them in orzo! ), or mixed into a meatloaf! I know you and your family will love the line of just fruits and veggies that Just Tomatoes, Etc! has to offer! These are reasonably priced, packed with flavor, and something you can feel good about feeding to your family! This was just the snack I’d been looking for! Just Tomatoes, Etc! is giving you a chance to win a great resource to help teach your child about healthy living and health y eating! They are graciously offering one Chasing Supermom reader the chance to win a copy of their activity workbook, Think COLOR as you eat! This workbook is full of great activities designed to get your child thinking about healthy living. They will learn that B is for Bell Peppers, E is for Exercising, and Y is for YOU Cooking! 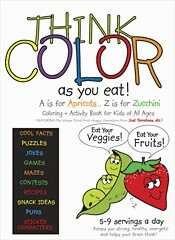 Each page features a coloring activity, fun games, recipes, and so much more! There is a sheet of fun stickers in the middle that your child will love. This is a great resource for home-schooling moms, teachers, or just moms that want to help teach their children about healthy eating, cooking, and living! You can purchase this activity book on the Just Tomatoes, Etc! website for just $4.95. Click HERE to buy this fun resource! They also have a list of great printable resources for moms and teachers! Click HERE to see what they have to offer! I’ve had these before and I love them. I would love the Just Grapes. Just what my 3 kiddos need! I’d love to get any of their fruit products as an alternative snack when the grandkids come over!! I would love the Just Blackberries. Sounds so good! I like Chasing Supermom on facebook. I like Just Tomatoes on facebook! I mentioned you on facebook (and tagged you in it). I want to try the pomegranate! Following Just Tomatoes on Facebook! Following Chasing Supermom on Facebook! Following Chasing Supermom on Twitter @mandalynns78! 3 – I don’t tweet & don’t keep a Blog, but I will go mention you on FB right now. I have tried the Just Veggie mix before & loved it. I would love to try the Hot version – I love spicy! Other entry – I liked you on FB! I’d like to try Hot Just Veggies. I’d like to try Organic Just Peaches. I would like to try the Just Fruit Snacks. I like Just Tomatoes, etc on Facebook. I like the Just Blueberries! I liked Chasing Supermom on FB! I liked Just Tomatoes on FB! I’d try the organic just tomatoes! I like u on fb…you’ve only got like 7 more likes to 1,000!!! I like Just Tomatoes on fb (I’m anne dall on fb). I follow u on twitter (i’m wowtotweet). I would like to try the organic just fruit munchies! I would love these for a family snack. One that Corey could ACTUALLY eat with all of his diet restrictions, and that is healthy for the rest of us. I like CS on facebook.